Sent to assist a Galactic Federation squadron stranded on the planet Aether, Samus Aran is thrust into an all-but-lost war between the dying Luminoth race and the umbral demons known as the Ing, on a world torn between light and darkness. While investigating a disturbance involving a Federation-led attack on the Space Pirates on the planet Aether, Samus Aran is thrust into a fierce war between the dying Luminoth race and their mortal enemies, the shadow-dwelling demons known as the Ing. not quite up to the original. This time Samus is sent to investigate the disappearance of a group of soldiers on a distant, out of the way planet called Aether. When she gets there she finds all the soldiers dead, Space pirates conducting Phazon experiments, and a war between two species, the Luminoth and the Ing, who live on a ghost version of the Aether, called Dark Aether. Samus is then pulled into war by the Luminoth. To make things worse, there's a malevolent version of Samus around, who is completely black. This time you don't lose so much equipment in the beginning, as this focuses more on story than exploration. You soon find out what happened to the soldiers, by scanning of course, and everything heats up from there. The controls are exactly the same as the first one. They work just as well in this game. You have new weapons, the Light, Dark, and Annihilator beams, as well as the standard power beams. You're kept using your power beams, as the other beams have a new ammo system. Killing with Dark gets light ammo, and vice versa. The graphics are a little better than the first, but are basically the same. The boss fights are excellent and the designs are second to none. The sound is just as great, making you feel like the person who stumbled onto a violent train wreck before anyone else. The music is reminiscent of its predecessor, but is equally good. The game play is a bit different, still focusing heavily on the Metroid theme, but there is a bit more action than the first one. Plus, there is the Dark World. In the Dark World the very atmosphere is toxic, quickly draining Samus's health just to be in there. As a safety precaution for the battles, the Luminoth have gone in and planted Light Crystals, that provide an umbrella of protection and slowly heal Samus. This really goes to creating tension and a sense of urgency at the danger of the situation. This game is great, but there is just something about it that is missing. I don't really know what it is, but its something. I guess it just doesn't have the charm of its predecessor. If I gave Metroid Prime a 10/10, which I do, I (so far, as I've not yet beaten it) give this one about a 9.1/10. When you enter Metroid Prime, you are aboard a wonderous, majestic yet somewhat creepy space station. As you move on, it becomes an epic. With Metroid Prime 2, things are different. The atmosphere you enter is very dark and frightening. As the game picks up, it moves away from this into and adventure game. Sadly, it does not measure up to its predecessor. 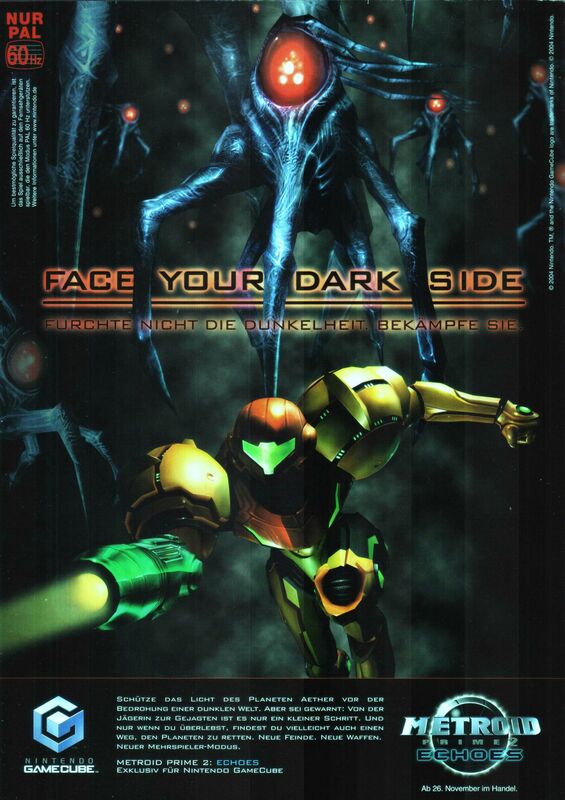 In Metroid Prime 2 you are in a fearsome battle against the Ind, Dark Samus, and the Space Pirates. Metroids? Where Metroid Prime had plenty of Metroids, this game provides very few. In this game, your mission is to restore energy to the temples on Aether but going into the dark dimension and take the energy transport module after battling a guardian. For the most part, the game is pretty good, but the dark world is just stupid. There are many annoying creatures that you fight repeatedly. The Space Pirates are now very easy to defeat. Their base is very different, and easy to get through. This makes for a disappointment for the space Pirates. So why is the game good? Well, it porvides some more action than the original. It also contains some of the coolest boss fights (Amorbis, Quadraxis, Dark Samus 3rd form). The coolest video game track invented is Quadraxis. It also has some cool places, with sanctuary Fortress coming in first, followed by Torvus Bog, Temple Grounds, and last- Agon Wastes (which did go to waste.) Overall, it's a good way to entertain yourself and creates a great story, so it's definitely worht the look. Same as above, except after the credits, a shot of the planet Aether comes up, showing how Dark Samus rematerializes again in space.